Private Chef for Short or Long-term Placements: Once we have received your online request we will get in touch with you to discuss your specific needs in further detail, PCI will than start contacting chefs that fit your household & present multiple candidates for consideration. We usually present resumes within 24-48 hours, after you had a chance to review them all we will assist with setting up interviews and trial days with the candidates you selected. Chef for an Event: Once we have received your online request we will get in touch with you to discuss your specific needs in further detail, PCI will than match you with an executive chef who will work directly with you to tailor a menu and create the perfect event within your budget specifications. Once all the event details have been confirmed with your chef, PCI will charge you a flat $100 booking fee, via credit card, to lock in your chef reservation. 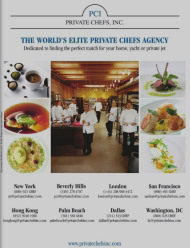 Private Chef’s Inc. is dedicated to finding the perfect chef for your specific needs.